Heartfield Was Born Herzfeld. Became Greatest Political Artist Activist, Groundbreaking Graphic Designer, Made Art Adolf Hitler Hated Most. 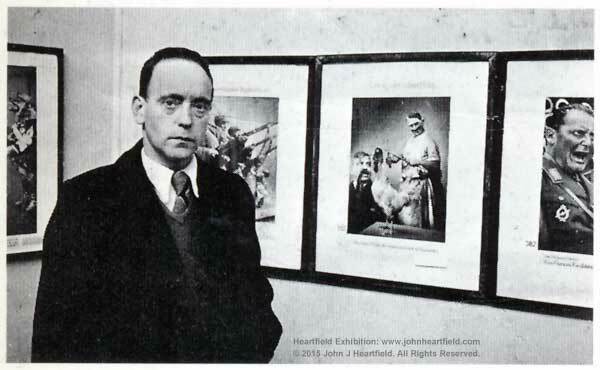 Heartfield Biography is an overview of John Heartfield’s life written by Heartfield’s grandson, John J Heartfield, the Exhibition’s curator. 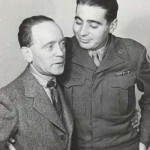 Professor Heartfield has added some material to the Heartfield Biography he wrote for The Encyclopedia of German-American Relations (ABC Clio Publishing). 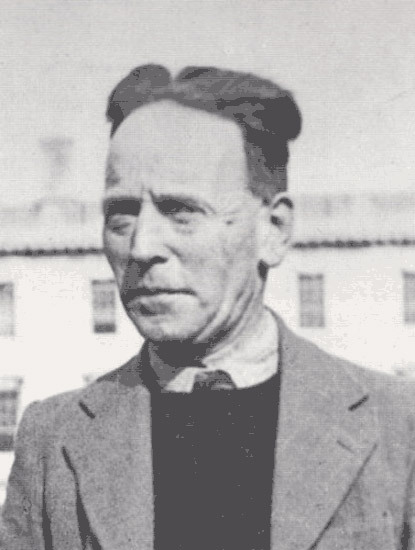 Heartfield Chronology is a listing (by year) of important events in John Heartfield’s life and times. 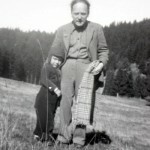 Heartfield Life In Quotes is a selection of quotes from colleagues, friends, contemporaries, and scholars to help illuminate Dada, German Politics, John Heartfield’s personality, his motivations, his process, and his impact. Words & Images are letters, illustrated postcards, and historic documents currently available in the Heartfield Exhibition. This section includes never-before-published words and images from the John J Heartfield Collection. Photos is a growing collection of photos, including never-before-published photos from the private collection of John Heartfield’s grandson. Video is an expanding collection of video, including rare never-before-published videos from the The John J Heartfield Collection. 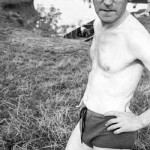 This is the frail five-foot-two body of the Political Artist, John Heartfield, who challenged The Nazi Propaganda Machine while living under its shadow. 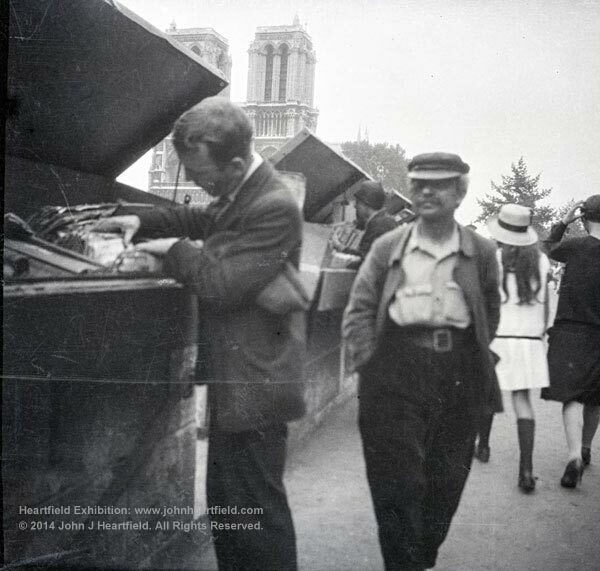 John Heartfield looking through a bin of magazines near Notre Dame (Paris, 1935). Heartfield with two of his greatest loves. 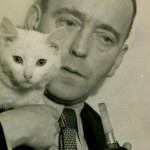 His pipe and one of his great variety of pets. 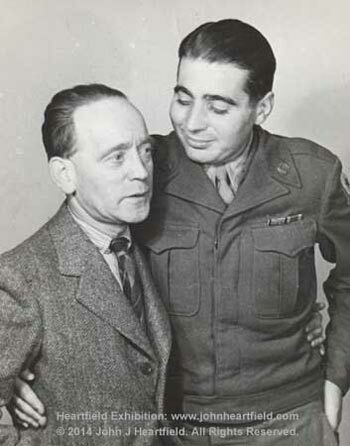 A proud John Heartfield with his only son, Tom George Heartfield, an officer in the American Army. 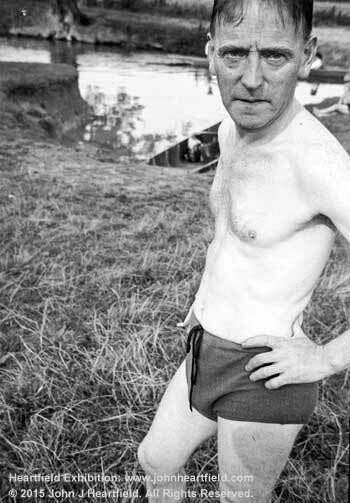 A severely ill John Heartfield following his short internment in an English camp in 1949. Heartfield learned to love London. In letters, he pleaded with officials to be allowed to remain in England for “my work and my health.” Instead, he was forced to return to East Berlin. 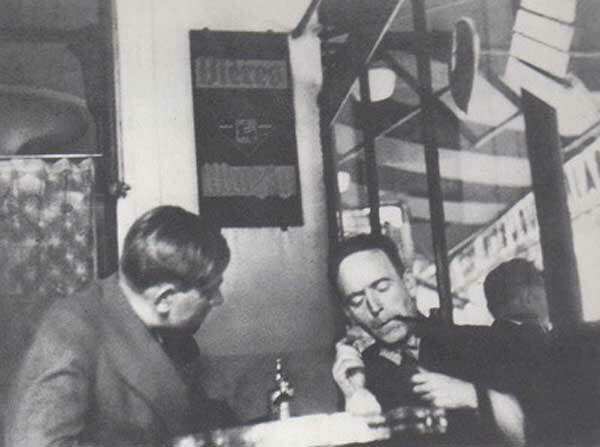 John Heartfield in Italy on a temporary visa from East Germany (GDR). 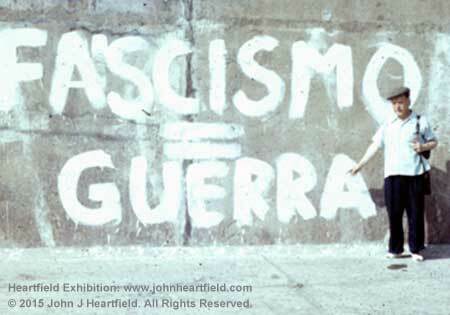 Heartfield poses next to an unexpected, but relevant piece, of graffiti. 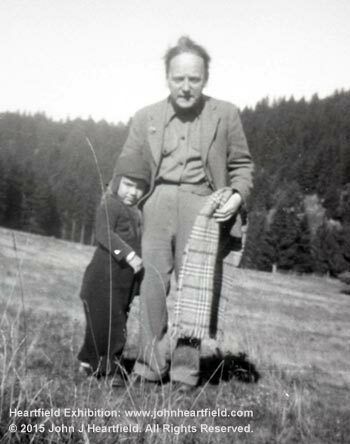 John Heartfield with his grandson, John J Heartfield, this exhibition’s curator. The artist is on a temporary visa from East Germany (GDR). 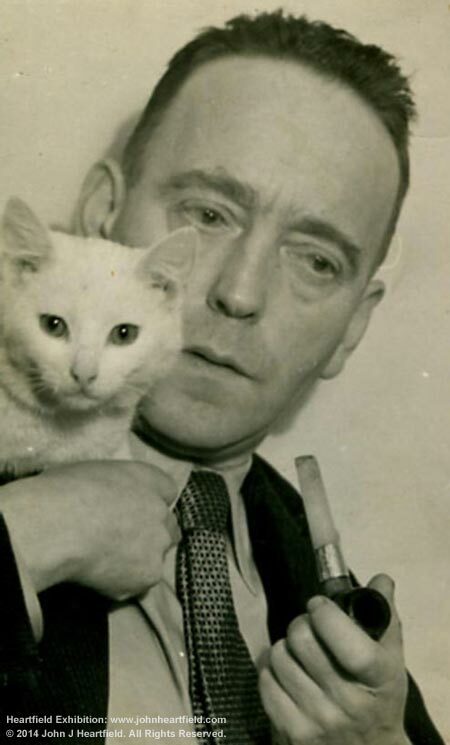 John Heartfield’s life story was cinematic in scope. His childhood instilled in him characteristics that enabled him to become not only a great artist, but also one of history’s most courageous artists. He considered all injustice as personal attack. He responded to those attacks with a fiery temperament that often overrode any consideration for his own safety. In 1889, the eight-year-old Heartfield, his brother Wieland, and his sisters, Hertha and Charlotte, were abandoned in the woods by their mentally disturbed parents. Soon afterwards, he chose the life of a struggling artist. Introduced to Dada art by George Grosz, Heartfield became an influential member of Berlin Club Dada. The short-lived German Dada movement still resonates in art, writing, and music in the 21st century. Known as a founder of modern visual montage, Heartfield has influenced generations of artists. This influence can be seen in mediums as diverse as films and digital graphic design. 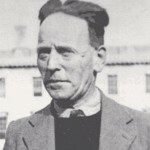 As a young man in Berlin, John Heartfield was hailed as one of the brightest stars in commercial graphic design. He was an innovator in typography. Working at Malik-Verlag Publishing in Berlin, he created the wraparound 3-D book dust jacket. The front of the book combined with the back to tell one cohesive story. Many customers bought Malik-Verlag books simply to enjoy Heartfield’s graphic designs, rather than the content of the book. 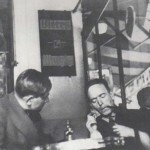 As a resident of Berlin, Heartfield understood that the bigotry, ignorance, and out-of-control nationalism in the propaganda spread by Adolf Hitler’s National Socialist Party (Nazi Party) was a prelude to another world war. Risking his life time and again, the frail artist became world famous for his Photomontages of the Nazi Period – brilliant widely distributed images that were a successful answer to Hitler’s insane vision. These complex satiric indictments of Adolf Hitler, The Third Reich, and fascism made him number five on the Gestapo’s Most Wanted List. 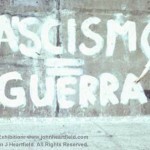 Heartfield continued to create his “art as a weapon” as he was hunted throughout Europe. Throughout his life, he designed complex brilliant stage sets, costumes, and projections for playwrights such as Bertolt Brecht and Erwin Piscator, a lifelong friend and collaborator. The Exhibition is always expanding. Please join our social networks, such as Facebook and Twitter, for important updates.